The Pamir mountain range straddling the border between China, Tajikistan and Afghanistan lent its name to a specific group of Eastern Iranian languages, the Pamir languages. Speakers of these languages belong in majority to the Ismaili branch of Shia Islam. They are known as Pamiris. 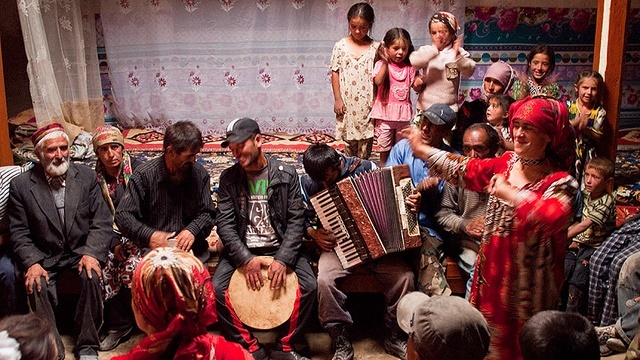 As speakers of unwritten, minority languages and as members of a religious minority in Central Asia, the Pamiris have long been marginalized and at times even persecuted by those who were in power – most recently during the civil war that raged in Tajikistan almost immediately after the dissolution of the Soviet Union. The civil war and the ensuing developments in Tajikistan and Central Asia at large have led the Pamiri community to rethink its identity. In this lecture, I propose to explore the role of cultural production, in particular performance practices, in (re)shaping Pamiri identity, in the more recent past, against the background of Soviet and post-Soviet language and culture policy. Gabrielle van den Berg is associate professor at the University of Leiden. She studied Persian language and culture at the University of Leiden and at the University of Dushanbe, Tajikistan. She has held positions in Leiden, Cambridge and Brussels. Her research interests include Persian literature and the history of Iran and Central Asia; she has published in particular on the oral traditions of the Ismailis of Tajik Badakhshan and the Shahnama manuscript tradition. This event is presented in collaboration with the Center for Near Eastern Studies.